Implications of Early Childbearing in Nigeria – Royal Times of Nigeria. Our country has a relatively young adult population compared to the rest of the world. As an unfortunate consequence, we also have a high occurrence of early childbearing. According to Hope for Nigeria online, the average mean age of Nigerian mothers at first birth is twenty years and three months (HfN). Compared to the world average range of eighteen to thirty-one years at first birth (Photius), Nigeria has one of the highest occurrences of early childbearing in the world. Even more disturbing is the Nigerian maternal mortality rate. According to Minister of Health, Professor Isaac Adewole, Nigeria contributes fourteen per cent to global maternal mortality, despite only contributing two point four per cent to the global population. Early childbearing is most common in the rural, poor, less educated areas of Nigeria. 22.3% of girls aged 15-19 have had a live birth in rural Nigeria, compared to 5.1% in the more urban areas. 38.4% of uneducated girls of this age are mothers, compared to 0.4% of girls of this age in higher education. According to findings by Nicola Branson and Tanya Byker (2018), early childbearing results in worsened economic outcomes. As early childbearing is already most common in the poorer sectors of Nigeria, the effects of it exacerbate the already existing poverty within those sectors. Most girls who are forced into motherhood or marriage at a young age are subject to the pressures of rural Nigerian society. From a young age, the girls are indoctrinated into their roles as mothers and wives and taught to aspire to this. What’s worse, Nigerian rural society has become desensitised to premature death and do not see the need to fight it. Indeed, although having medical implications, the issue is mostly one of social norm. The problem calls for a re-education of the population that encourages and upholds early childbearing. The federal government must increase the public’s awareness of its implications for both the young mothers and the infants. 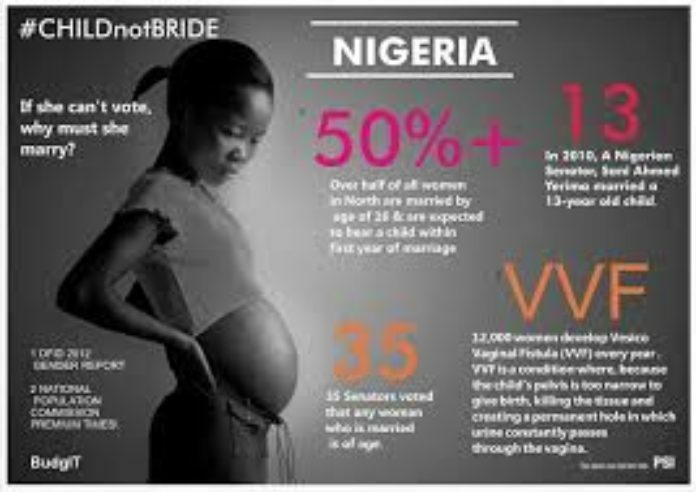 According to UNICEF, Nigeria loses about 2,300 under-five years old and 145 women of child-bearing age every single day. In the last two years, however, our country has seen an improvement in these statistics. Infant mortality refers to the probability of death between birth and the first birthday. Infant mortality is more common in cases of early and teenage childbearing. Nigeria’s infant mortality rate saw a decline from 76 to 70 per 1,000 live births within the 10 years preceding the survey, according to the National Bureau of Statistics. Though encouraging, this change is not enough. According to UNICEF, Nigeria still has the third highest number of new-born deaths in the world. What follows is a need for re-education. We must eradicate early childbearing in order to create a safer Nigeria for our children and mothers alike. Then and only then may we hope to see our human development reach its full potential in generations to come. May God Bless the people of our beloved Country, Nigeria.